Travel times on this section of the route show the effect of the Parliament/Queen/Coxwell diversion in June-July 2017, and the absence of through service from Main Station to Yonge Street in July. At other times, the data represent travel via the standard route. During the 8-9 am period, there is a drop in travel times in mid-March that is not matched in other data between 6 am and noon. During the afternoon, notably during the 5-6 pm period, travel times in March are a bit shorter than in January. During the evening, there is only a slight decline in March relative to January. Travel times are slightly shorter during the peak hours for buses in March versus streetcars in January. The effect is smaller during the off peak hours. The eastbound speeds for buses tend to be better in areas where they get a fairly free run. It is worth noting that the average speeds for buses (and occasionally streetcars) exceed the 40 km/h speed limit fairly regularly. On the western half of the route, travel times are affected by diversions between June and October 2017. There are some differences between the January and March values, but not to the same degree as for the eastern half. As on the eastern half of the route, the points where buses show higher average speeds than streetcars are for the intervals where they reach top speed between stops. Comparative speeds west of Lansdowne were affected by construction that affected the bus running times. 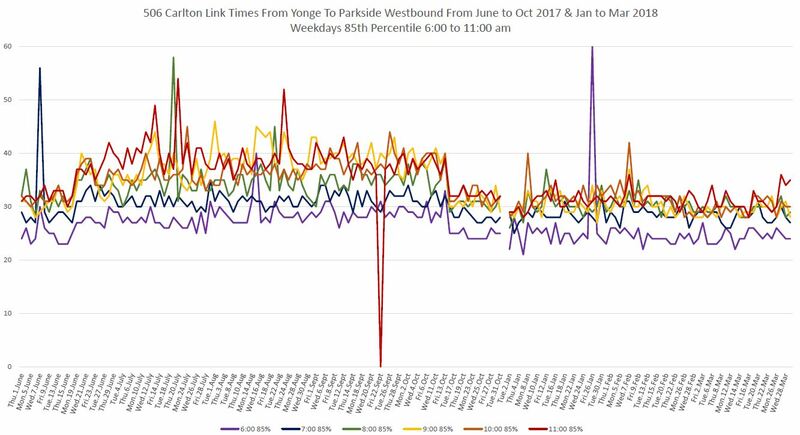 The speed chart for buses extends to High Park Station via Parkside (a particularly brisk part of the route where the speed limit is 50 km/h) and there are no corresponding streetcar data. As with the westbound trips, there are slightly shorter time for buses, but the effect is smaller than on the east end of the route. The charts above show a lot of the fine grained detail of travel time behaviour, but miss one obvious point of comparison: how long does it take for a vehicle to travel across the entire route? The “full trip” time is measured between the intersection of Main & Danforth and Parkside & Howard Park. 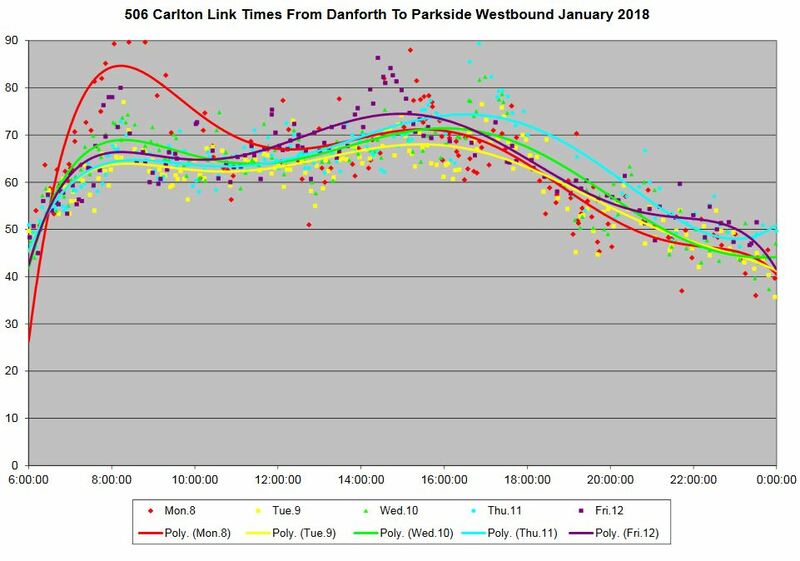 This omits terminal times which can be highly variable given the tendency of vehicles to take long layovers due to schedule padding, and it clips off the extended route of the 506 bus to High Park Station so that the same distances are measured for both modes. None of the data have been filtered to omit the effects of storm days or service delays. Both January and March include weeks with school breaks (first week of January, middle of March) during which traffic is lighter than normal. Statutory holidays (New Year’s Day, Family Day, Good Friday) are included with Sunday data. 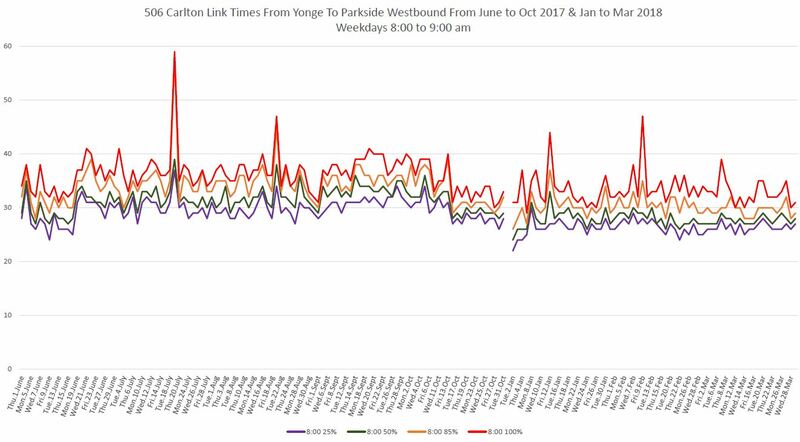 Data have not been broken out by days of the week as I did for some of the King Street Pilot charts, except for weekends. 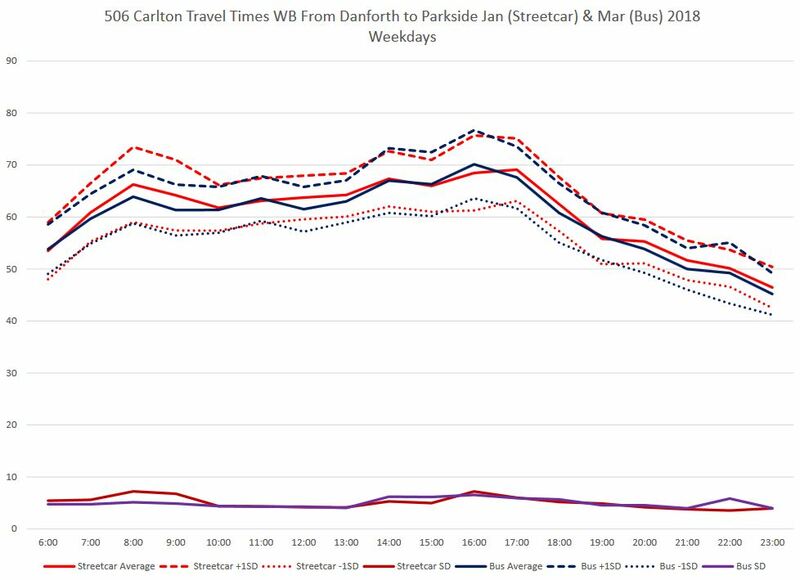 The sample page below is for westbound trips on weekdays, and it compares the data for January (streetcars) with March (buses). The linked PDF contains six charts for weekdays, Saturdays and Sunday/Holidays; eastbound and westbound. The solid lines in the middle of the bands at the top of the chart are the average travel times for each mode. The data are averages of all trips taken during each hour of the day (assigned to the hour when they began) for all weekdays in their respective months. The solid lines at the bottom are the standard deviation values (SD) for the data. The dashed and dotted lines show the range of one SD plus or minus from the averages. For westbound trips, the average lines lie almost on top of each other for all days including weekends. Travel times are shorter on Saturdays, and shorter again on Sundays. Weekdays show the familiar double-humped curve for the AM and PM peaks with the PM peak being higher as there is more competing traffic on the roads in the afternoon. The standard deviation values are almost flat through the day showing that there is only a small difference in the range of observed values between peak and off peak. For eastbound trips, the bus averages are a few minutes shorter than the streetcar values during many periods, but the standard deviations are quite similar. The differences, such as they are, are not uniform across the route as the detailed speed comparison charts above show. Also, the irregularity in headways can contribute more to the length of a trip by either mode than the actual in-vehicle travel time differences, where any exist. For an even more detailed look, the following charts show all of the travel times for each month and direction. Here is a sample page showing westbound trips in the second week of January. Each dot represents one trip, colour coded by day. The trend lines are a polynomial interpolations (6th order) to show the overall shape of the data. There are five charts, one for each week of the month, and separate charts for Saturdays and Sundays. One page consolidates all of the data for weekdays. The purpose of this is to show the shape and distribution of the data. Average values will thread their way through this cloud of points, while standard deviations will reflect the scatter of values around the averages. The chart sets also include average and standard deviation values for each type of day. These are the same values as used in the Bus to Streetcar comparison chart above. The lines for each day are always slightly different depending on conditions (weather, congestion, delays, special events). For example, Tuesday, January 2 was a lighter than normal day for traffic and this is reflected in the travel time values and trend line. Similarly Saturday, January 6 and Monday, January 1 have lower travel times than other weekend days. 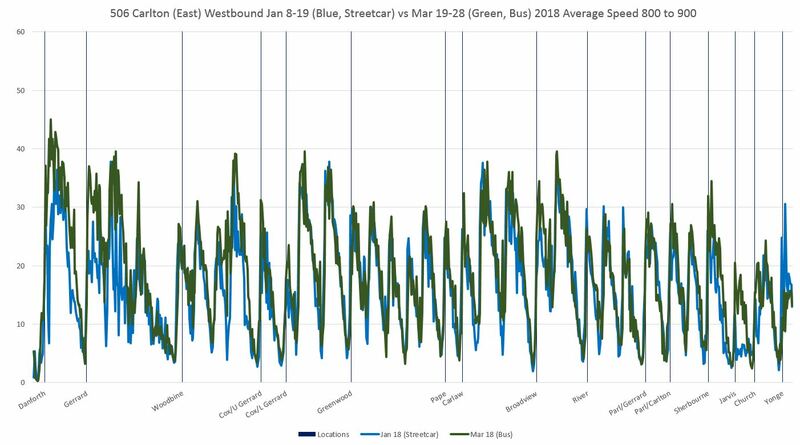 February data are included here to show the change, or lack of it, between the streetcar weeks (up to Saturday, February 17) and the bus weeks (after Sunday, February 18). Average and SD values are not included in these charts to avoid mixing data from the two modes together. In the March data, Thursday the 29th was a storm day, and this is reflected in longer travel times through much of the day. A couple of weeks ago the stops along College were moved from the safety islands over to the curb lanes. This is asinine, of course; especially on a street with a bike lane. Now it seems like the stops have been moved back to the safety islands. The TTC seems to go back and forth on this issue a lot. Is there a good reference, or do you have a comment, on the thinking behind either choice? Steve: The TTC’s usual standard is for buses to load at the curb, but I don’t think they took into account that there are still some safety islands left on College that are beside bike lanes. I suspect it’s either an oversight, or a case where the decision was made by someone who does not know the route in detail. Steve said: I suspect it’s either an oversight, or a case where the decision was made by someone who does not know the route in detail. One rather fears that this is the same person who actually ‘manages’ the route as many route management problems seem to be caused by a lack of local knowledge. What was the median and standard deviation of travel time for bus and streetcar? Steve: The median is the 50% line in any of the charts. As for the SD values, I have used them on other charts, but many don’t understand what they mean, and they’re an abstraction. Also, there is the question of SDs bouncing around a lot at the level of data where I am reporting for only one hour on one day at each data point. “N” is comparatively small. On Bathurst and Lake Shore, I found that buses usually use the stops at the safety islands, but it depends on traffic and where people are waiting. Sometimes when travelling in pairs both will be used at the same time. With respect to headway monitoring and on street supervision, I noticed today (Sunday) there was a supervisor out on King Street at Church on the westbound side Church stop. He poked his head in the rear door and tapped the Presto reader with a card then went back to the sidewalk. What specifically was the purpose of this? Is it somekind of vehicle tracking record keeping with Presto? Steve: I believe this is a regular test to see which readers are working. I don’t think that the TTC believes some of the availability numbers they get from Presto. Of course, checking only one reader on a car is hardly a full test. When a line is busy and people cannot move between readers, having one working at the back door is useless if you’re not nearby. Similar problems happen with the fare vending machines on the new cars. What about median cycle time between bus and streetcar? Its very difficult to get any sense of comparison between the two from any of the graphs above. The speed graphs seem to imply the buses are running faster but how much time over the entire route cycle does this add up to? 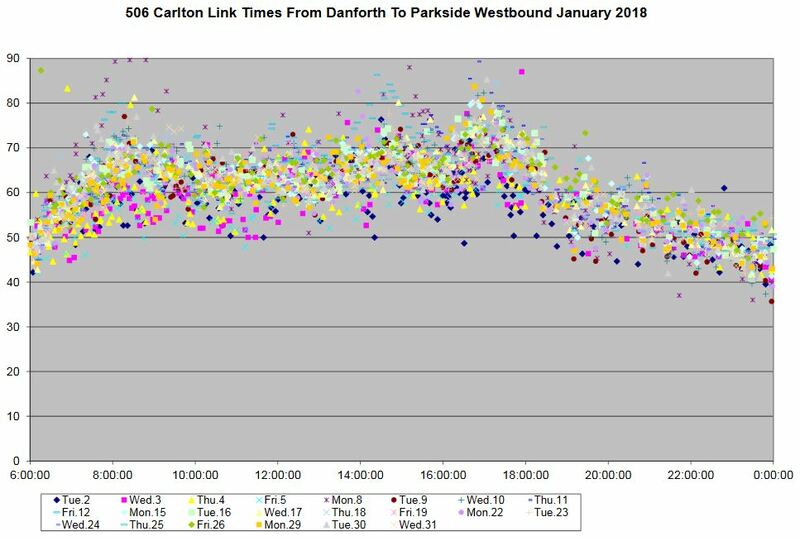 Steve: If you look at the charts of travel times over each half of the route, and match this against the dates, you can see periods when buses were faster, or not. You can read medians directly off of the charts (50th percentile). I can generate charts showing end-to-end times for January, February and March, and add them to the post, but you will have to wait as I am working on something else. The cycle time is meaningless as a comparison for two reasons. First, the bus route is longer than the streetcar route (buses go to High Park Station). Second, all vehicles have layovers of varying lengths at the terminals. If this is included as part of “cycle time”, it does not reflect actual driving conditions. Updated April 23 at 9:30 am: Charts of full trip times have been added. Westbound it’s a draw, eastbound the buses are slightly faster. Note that the new charts use averages (arithmetic means), not medians, because standard deviations are relative to the average values. “A couple of weeks ago the stops along College were moved from the safety islands over to the curb lanes. This is asinine, of course; especially on a street with a bike lane. Now it seems like the stops have been moved back to the safety islands. The TTC seems to go back and forth on this issue a lot. Is there a good reference, or do you have a comment, on the thinking behind either choice? The other day, westbound at College and Spadina, there was a sign at the curb saying the stop is not in use, and that it had been moved to the transit island. However, I saw a driver stop at the curb lane, which required people waiting at the island to scurry across a lane of traffic back to the bus stop. So it seems that drivers are either receiving inconsistent or incorrect instructions, or just do what they like! Perhaps this has been addressed before, but are there any ways of preventing gapping and bunching from rising as one moves across the route? Steve: There must be an operational culture of keeping vehicles spaced apart, sitting at terminals and enroute if necessary to do so. This requires central management that can “see” the behaviour of gaps, but it also requires an acknowledgement at the highest level of how commonplace the problem is. It is the rule, not the exception, a part of “TTC culture”. I often arrive at High Park station to find the electronic board saying that the next two 506 buses eastbound are leaving in “9 min and 9 min” or “11 min and 11 min.” Is there some reason that they are intentionally having two buses leave from the terminus together, when they could be more spaced out? Steve: This is probably because there is a pair of buses somewhere near Roncesvalles running together, and so NextBus shows their predicted departures together too. One advantage of the bus service for those living near High Park station which is a high-density area (and which the planners want to become more so), is that the 506 route has been extended to go there rather than end in High Park. The streetcar route does not have the flexibility of being extended in this way (or at least I have never heard it be considered). Steve: And it is rather unlikely given the amount of new track this would involve. If anything, Keele Station would be a more likely connection point were it not already full of bus routes (which is why the 506 bus goes to High Park). Thanks for adding the graphs on end to end times, I think it’s much easier to get an ‘overall’ (but admittedly limited) picture with these. The poly interpolation graphs are also really nice so I think you should keep using them! Steve: I have charts coming out of my ears in various formats, and there are advocates/aficionados of each type. Also I get complaints about there being so many, but in an analysis like this there are many ways to look at the same data to bring out various aspects of the situation. I should probably mention that because I have been doing this sort of thing for years, I have a repertoire of chart formats, and add to this from time to time when requests come up. I used to publish the scatter diagrams with the trend lines, but then many readers wanted percentiles. Each one tells its own tale!